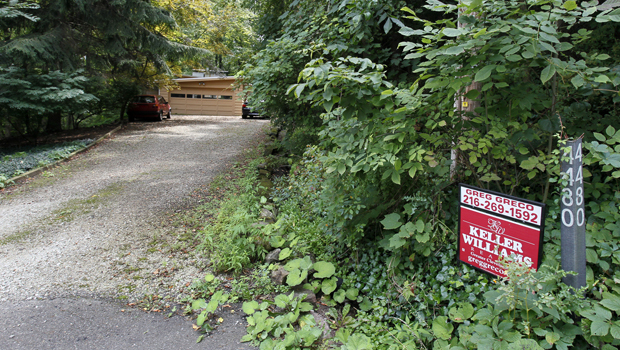 BATH, Ohio -- The house where serial killer Jeffrey Dahmer grew up and committed his first murder is for sale again in northern Ohio. Situated on a private wooded lot in a wealthy neighborhood near Akron, the three-bedroom home is priced at $295,000. The home was first listed two years ago before being pulled off the market. Realtor Rich Lubinski said it failed to sell then because of the depressed housing market and its notorious past. "If you can get past that little problem, you'll have a wonderful place to live," said Chris Butler, the home's current owner. He bought the house in 2005, well aware of its history. He said he was drawn to the house by its 1950s style and wooded lot. "The fact that it was Jeffrey Dahmer's house was not an attraction," Butler told WKYC-TV in Cleveland. "I am not a ghoul. I am not interested in the supernatural." Dahmer and his parents moved into the house in 1968 when he was 8 years old. Ten years later, he committed his first murder there, killing a hitchhiker he had brought home and then burying the remains in the woods. Dahmer moved to Wisconsin in 1982 and went on to kill 16 more people before his crimes were discovered in 1991. He was killed in prison in 1994 by a fellow inmate. Lubinski said he has gotten calls every day about the house since it went back on the market about two weeks ago. About half the people don't seem to care about its past, he said. "The others, they're immediately not interested," he said. He tells potential buyers that "this house never killed anyone." The ranch-style house was built in 1952, and a year later it was featured in the Akron Beacon Journal for its modern style, open layout and floor-to-ceiling windows that provided views of the wooded hillside. It's shielded by trees, but still draws attention. A film crew from Japan came last month for a story on who lived there. The house isn't open for tours, and Lubinski will only show it to serious buyers. "This is not a museum," he said.